RT America's Alexander Rubinstein was arrested while covering the protests near McPherson Square in Washington, DC. He was in the crowd, covering protesters when police circled a group of people. Update: At 8:28pm Eastern, RT's DC reporter Alexey Yaroshevsky tweeted that Rubinstein had been released. Rubinstein was among the group arrested at 12th and L Streets NW. He is being taken into custody, even though he showed police his media credentials. RT America has many reporters covering the inauguration from various aspects. Rubinstein was following the DisruptJ20 anti-capitalist march. The National Park Police surrounded the group, corralling them with riot shields, Rubinstein said. It's reportedly illegal to "kettle" protesters in this manner, and there is already talk of a lawsuit among the group. "We're just waiting, the police are filming us, waiting for them to arrest us, surrounded by riot shields," he said. Police appeared to be taking people one at a time. It is unclear if they were being detained or arrested. The group was arrested and charged with rioting, police said in a statement. "Pepper spray and other control devices were used to control the criminal actors and protect persons and property," the Metropolitan Police Department said. "During the incident, police vehicles were damaged and two uniformed officers sustained minor injuries from coordinated attacks by members of the group that were attempting to avoid arrest." RT America has reached out to both the Metropolitan PD and the US Park Police about Rubinstein's arrest. 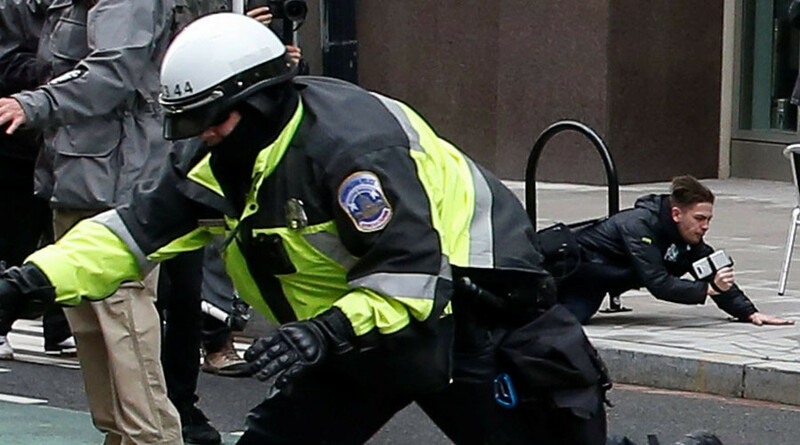 This is the first mass arrest in DC in 14 years, according to DisruptJ20, but that information could not be verified by RT.